Playtime used to mean children freely exploring neighboring fields and vacant lots. They climbed tress, make friends with the frogs and the caterpillars and built forts with their friends. They cultivated a deep relationship with the natural world around them. Times have changed, but playtime doesn’t have to. You’ve discovered PlayWood Plus a commercial play system rooted in the natural world, but built to today’s exacting safety standards for playgrounds. 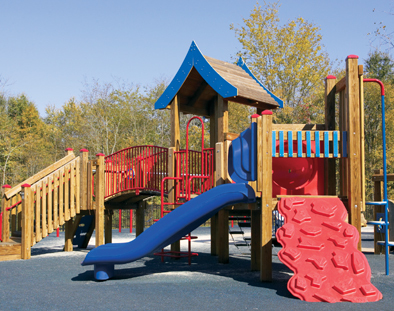 Manufactured in the USA by Play Ventures, Inc, PlayWood Plus product line was formerly manufactured by Henderson Recreation Equipment Ltd. PlayWood Plus products are designed to meet and exceed the most recent safety standards and when needed can be designed to conform to ADA accessibility Guidelines. Playgrounds have been constructed in the United States, Canada and overseas since the early 1970’s. We have a limited guarantee on all of our products. Our goal is to help you every step of the way to create an imaginative place for children to play, grow and learn. We’re here to help you select and design the right equipment to fit every budget. Contact us today. Or contact one of our local distributors.